This is an excellent recipe. It can be frozen or prepared a day ahead of time and baked the next day. I did change the original recipe, mainly because I thought it was lacking in Italian seasonings. My changes will be in parenthesis next to the original ingredients. Preheat oven to 350 degrees. Combine spinach, ricotta, Parmesan, egg, salt and pepper in a medium bowl. (I think I will also add a little basil and oregano to this mixture.) Ladle about 1 cup sauce on the bottom of a 9×13 baking dish. 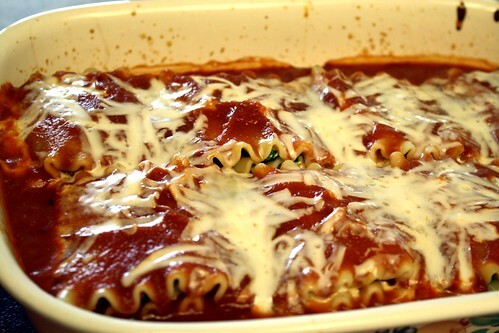 Ladle sauce over noodles in the baking dish and top each on with 1 tablespoon mozzarella cheese. Put foil over baking dish and bake for 40 minutes, or until cheese melts. Posted on March 13, 2013 by cookingwithpizazzPosted in Freezable, Meatless Main Dish, PastaTagged Food, Freezable, Meatless Main Dish, Pasta, Recipe.